Enterprises are hardly going “all-in” on the cloud for their data protection needs. Your colleagues recognize that while the public cloud might be optimum for Tier 2 applications, they much prefer to retain certain critical data processes on-premises. Not to mention the higher price tag that public cloud often comes with. What are your other options? This paper presents a series of questions to ask yourself and your team when evaluating your scale-out data protection options to achieve greater resiliency, availability, and cloud-like agility on-premises. 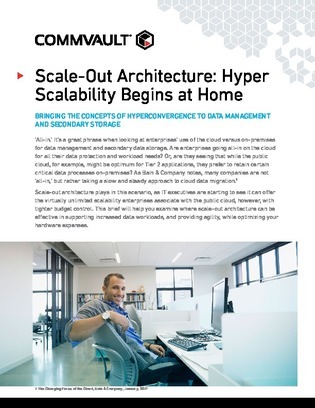 Read on to see how options like hyperconverged data protection provide needed agility while optimizing hardware expenses.